Editor(s): Dorotovic, I.; Fischer, C.; Temmer, M.
In October 2015 the Observatório Geofísico e Astronómico da Universidade de Coimbra in Portugal (OGAUC, the Geophysical and Astronomical Observatory of the University of Coimbra) invited the international solar astronomy community to Coimbra for the second time to discuss the state-of-art of solar ground-based and space-based observing techniques and topics related to solar astronomy. These proceedings provide a comprehensive overview of solar phenomena observed over the entire electromagnetic spectrum studied for a wide range of scientific purposes. The topics included in this book cover the quiet and active Sun, including solar magnetism and eruptive phenomena, and long-term variations of the Sun, including solar irradiation variations and space weather changes. The volume also discusses advances in theory and modeling, with comparison to observations, spectro-polarimetric data processing techniques, and solar image data management. An additional section on existing facilities and future perspectives in the field of solar observations gives a glimpse of the exciting times ahead. 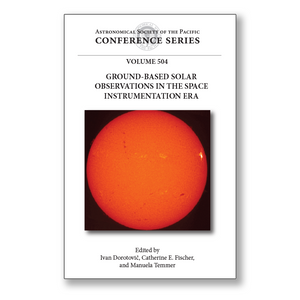 The extensive reviews on controversial topics in solar physics, such as quiet sun magnetism and the status and need for long-term synoptic observations and future instrumentation projects, make the book a valuable reference for researchers and graduate students pursuing research in ground-based and space-based solar observations.